Rrrrgghhrhhh....brrrrraaaaaiiinnnnssss...... Oh whoops, sorry, you'll have to excuse me. The other day I got bitten by this really strange looking child who had half their face dissolved and ever since then I've had the most peculiar cravings. Cravings for BRAINS! However, when brains simply aren't available or a practical option, I also freakin' love me some cupcakes! They're sweet, chocolatey, slightly less messy to eat. 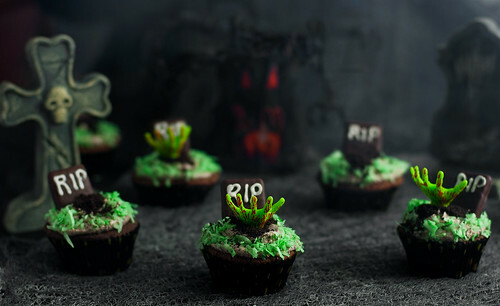 In celebration of The Walking Dead Season 2 premiere tonight and all things Halloween, I made a graveyard of cupcakes like the good little baking zombie I am! These chocolate cupcakes come complete with a gooey green coconut center, dirty caramel buttercream, and a most delicious gravestone. They're perfect for a party or just for fun to get you into the Halloween spirit! 1. Preheat oven to 350 degrees with rack in center. Whisk together flour, baking powser, baking soda and salt in a medium bowl. Set aside. 2. In the bowl of an stand mixer fitted with the paddle attachment, cream butter and sugar on medium speed, scraping sides of bowl as needed, until light and fluffy. On low speed mix in the melted chocolate. Increase speed to medium and add eggs, one at a time, mixing well after each addition. Add vanilla and beat until mixture is creamy and light in color, about 1 minute. Mix in sour cream. 3. On low speed, add half of reserved flour mixture, beating until just incorporated. Mix in 1/2 cup water. Add remaining flour mixture and mix just until incorporated. 4. Line a cupcake pan with paper liners. Fill each liner about 2/3 the way full. Bake, rotating pans halfway through, until tops are firm and a cake tester comes out clean, about 20 minutes. Cool for 10 minutes in the pan on wire racks, then carefully remove from the pan to finish cooling. 1. Whisk egg yolks in a small bowl and set aside. Combine sugar, cornstarch and salt in a small saucepan. Whisk in milk gradually, and cook, stirring constantly, over medium heat until the mixture boils and thickens, about 10 minutes. Remove from heat. 2. Slowly whisk in about a 1/4 cup of the hot milk mixture into the reserved egg yolks to temper. Add the yolk mixture back to the pot with the milk and cook over medium-low heat whisking constantly, until the mixture bubbles and thickens. Remove from heat and stir in coconut, vanilla and food coloring. 3. Transfer the pastry cream to a small bowl and cover with a sheet of slightly greased plastic wrap, pressing it directly onto the cream and chill until cool, at least 1 hour. 1. Pour 1/4 cup water into a small saucepan and add 1/2 cup plus 2 tablespoons sugar. Cook over medium-high heat, stirring occasionally, until sugar is dissolved and syrup is clear. Continue to cook, without stirring, until syrup comes to a boil, washing down sides of pan with a wet pastry brush two or three times to prevent crystals from forming. Let syrup boil, gently swirling pan occasionally, until syrup is dark amber. 2. Remove from the heat and carefully pour in the cream. Stir caramel until smooth then pour a small bowl to cool. 1. Place the buttercream in a piping bag fitted with a large round tip (or a ziploc bag with a corner cut off). Set aside. 2. Place the flaked coconut into a large ziploc bag, add the food coloring and shake the back until the color is well dispersed. 3. Using and small serrated knife, carefully cut out a small cone from the top of the center of each cupcake, making enough room to fill with about 1-2 Tbsp of pastry cream. 4. Spoon in 1-2 Tbsp of the pastry cream into the center hollow of each cupcake. Pipe a generous amount of buttercream, swirling from the edges to the center. Press some of the colored coconut flakes just around the edges of the cupcake on the buttercream. Using a spoon, create a small dent in the buttercream in the center of the cupcake. Place a gravestone behind each well, then spoon a heaping teaspoon of the cookie crumb "dirt" over each well. Top with a zombie cupcake topper if desired. 5. Enjoy alongside a serving of brains with your favorite fellow ghouls and goblins! I just read through all your entries. 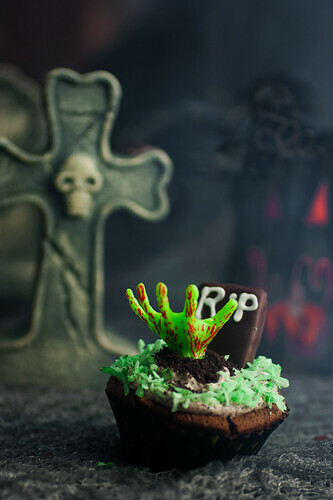 This is the best Halloween cupcake I've seen so far. Great work on the designs :) nice pictures. Great job... they are just adorable!